Chesterton takes us back to the biblical understanding of repentance when he says reform has to include the original form – not just of things, but of ourselves and what we have given our word to. It is futile to talk of reform without reference to form. Re – forming something is not changing to a different form entirely but going back to the first thing, the original, as in a straight line that has somehow become crooked, and straightening it back out. This is the act of repentance: not only stopping the wrong, but putting it right again. The biblical illustration of Zacchaeus gives us a beautiful example of full repentance when he, a hated tax collector, tells Jesus that he will give back, with interest, what he has stolen from others. Note Jesus’ response to Zacchaeus’ act of repentance. Imagine hearing emphatically from the mouth of the Lord, that you have been saved! The relief, the cleansed feeling, the recognition in our spirit of the son of God , the Father actually created us to be. 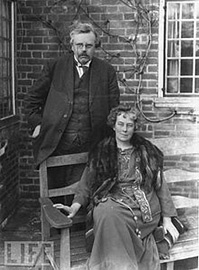 Reform, as Chesterton was to discover in his own repentance towards becoming a Christian, involved changing behavior but also changing one’s mind to return to the lost true self: the re – forming of how we view our wants and our actions to “conform to the image of his Son” (Romans 8:29), that very first of things created, our exemplar, the only begotten Son of God, the Christ – the original form of what man was to be, this “last Adam”, a perfect man. As a young man full of all the latest ideas, Chesterton was sure all of that was wrong, until he discovered that it was right. For if this book is a joke it is a joke against me. I am the man who with the utmost daring discovered what had been discovered before…No one can think my case more ludicrous than I think it myself; no reader can accuse me here of trying to make a fool of him: I am the fool of this story, and no rebel shall hurl me from my throne. I freely confess all the idiotic ambitions of the end of the nineteenth century. I did, like all other solemn little boys, try to be in advance of the age. Like them I tried to be some ten minutes in advance of the truth. And I found that I was eighteen hundred years behind it. I did strain my voice with a painfully juvenile exaggeration in uttering my truths. And I was punished in the fittest and funniest way, for I have kept my truths: but I have discovered, not that they were not truths, but simply that they were not mine.